During World War II, future leaders of the National Mental Health Association worked in state mental hospitals. There, they witnessed the deplorable and inhumane treatment of patients with mental illnesses who were chained to the hospital walls. This experience inspired the men to devote their time to improving the lives of all those who suffer from mental illnesses, and changing the way America thinks about persons with mental illness. 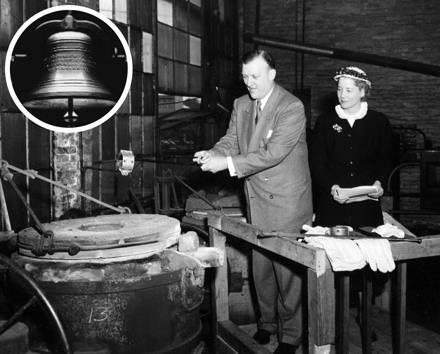 In 1950 the leaders of the National Mental Health Association chose a bell as their symbol. Two years later, volunteers at the Mental Health Association's National Headquarters in New York collected the metal restraints from hundreds of mental hospitals across the country and piled them in the building's lobby. These restraints were then shipped to the McShane bell foundry in Baltimore, Maryland, where in 1953, they were dropped into a crucible and cast into a 300 pound bell. Presidents, national mental health leaders and a host of others from around the world have rung the Mental Health Bell, which stands as a national symbol for the mental health movement. When not in use for such special events, the Mental Health Bell is displayed at the National Mental Health Association's Headquarters in Alexandria, VA. Founded in 1909 by Clifford W. Beers, who suffered from a serious mental illness, the National Mental Health Association is the nation's oldest and largest non-governmental, citizen’s voluntary organization concerned with all aspects of mental disorders and mental health.